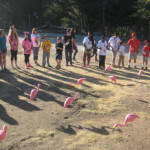 A summer camp for Central Coast children with speech and language disorders has cancelled its 45th year of operation, following a dispute with the San Luis Obispo County Office of Education over a legal issue, according to a news release issued by a volunteer group that runs the camp. Camp Hapitok is a four-week program for speech-impaired elementary school students that has partnered with the county for at least the past 40 years. The county provides funding for the camp, as well as a sleep-away facility at Rancho El Chorro Park. County Superintendent James Bresica told KCBX that he was planning on renewing the annual agreement with Friends of Hapitok, and he asked his legal counsel to review the document. But, the attorney informed Bresica that the county, rather than the volunteer group, must operate the camp if the county is to keep funding the program and providing a location. Friends of Hapitok President Marie Larsen said in the press release that the county informed the volunteer group of the situation in January. That did not leave enough time to make other arrangements, Larsen said. Campers are not currently charged to attend Hapitok. They are paired with teen volunteers, and they sleep four nights a week at the camp. Now, now, people, let’s not tar and feather poor anointed Superintendent Bresica and his convenient legal counsel so quickly. I’m mean he was planning on allowing a 45 year long program for language impaired children like a dutiful public servant, but now all of a sudden there’s this catastrophic risk associated with it and he doesn’t want to put at risk the People of San Luis Obispo County. Thank you, thank you from saving us from a mulit-million dollar lawsuit…somehow, some way! Phew!!! I can sleep at night now! I’m sure it’s not that he didn’t want to keep at-risk language impaired children from being better communicators is it? Nahh….that would be too cynical. But the real outrage is how flippant Superintendent Bresica is on the matter. I would expect a little noise coming from his office helping these children, especially at such a critical stage in their learning development! If indeed there is some legal issue, he should be running it up the flag pole instead of “oh well…nothing I can do…it’s a legal matter”. But I suspect it has something more to do about control…there’s more to this story that isn’t being told. If this program was for Illegal Aliens there wouldn’t be a problem would there? Thank you Dr. Bresica for taking the initiative to try and mitigate the situation. Your personal donation, and waiving of the fees is a great start in getting the program back on track. Keep up the good work…these kids deserve it. There is only so much funding to go around so why would this program be axed while other programs for adults who just make bad choices remain? Many parents and their children with special needs will be injured by this closure. Wake up sheeple. How many more of these stories similar to this are we going to tolerate.